I’m confused, don’t the women come with booty, why do they thirst for that as well? It’s amazing what you can pick up on the way home at the local Spaaaargh. Garthland must be on Planet Wayne. He may be abducting two damsels, but his heart is with Bugs Bunny dressed as a girl bunny. Swords of the Barbarians. Sound choice there, Kenneth. Sporks of the Barbarians might have caused problems with the narrative. I knew I recognized Garth #1 from somewhere. Those flying dinos seem to be lacking all internal skeletal structures. 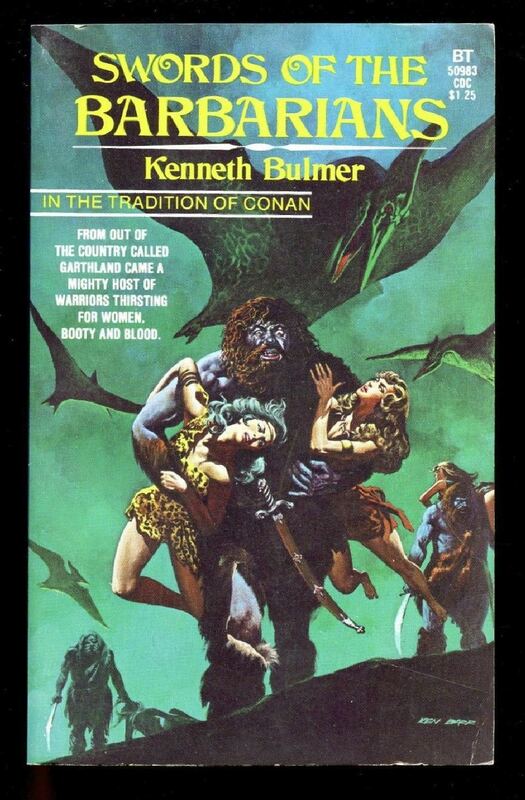 “In the tradition of Conan.” Translation: nothing like Conan. It would seem the artist was trying to up cheesy monster movie posters from the ’50s by having the big ogre-ish guy holding two women instead of one. There was a period of time between his expulsion from Hogwarts and his hiring on as groundskeeper that Rubeus Hagrid really fell in with the wrong crowd. Garth Land — or is it “Wayne’s World”? is awfully green. @MakkaPakka (1) The two chaps in the background only have one girl each, so I guess they’re the ones still thirsting for it. Greedy. @fred (6): I do hope he was less hirsute while working for the Post Office. Typical; raging barbarian in youth, then settles down to a civil service job. @BC (8): They’re helium balloons. @Lillie (11): You are indeed Awesome. Same path as I said above: raging barbarian, then working for an institution. Then it’s true what they say: Mountain men keep mountain women. Instead of seeking out women, booty, and blood they should have invested thier time into an anti-pterodactyl weapon. I’m no DSWBT, but I think those are pteranadons (big crest, no teeth) as drawn by someone who doesn’t understand how skeletons work (as B. Chiclitz pointed out). @GSS exnoob: I see, 6 brides for 3 brothers, could there be a musical in this? Poor barbarian. All the loot, all the dames, all the rubber Pteranadon you can eat, and he’s still blue. He misconstrued someone telling him to roll Mum on his armpits.